Start downloading now, boys and girls, because iOS 7 has just been unleashed upon an expectant world. However, whether you’re a Mac or PC, iTunes 11.1 is required to sync an iThing running iOS 7 with your computer — get iTunes 11.1 and iOS 7 right now. Assuming your iPhone, iPad and/or iPod touch is iOS 7 ready, then turn it on, tap Settings > General > Software Update — iOS 7 is now available, people, get it! For those worried about bugs and/or app incompatibilities, it’s good to know that Apple is already working on iOS 7.0.1, 7.0.2 and 7.1. Registered Apple developers got a taste of iTunes 11.1 GM on Monday when Apple seeded OS X Mavericks Developer Preview 8 and iOS 7 GM rolled to devs last week. Now, Apple’s ready to let in you into the party, too. —iTunes Radio — iTunes Radio is a great new way to discover music. Choose from over 250 stations or start a new one from your favorite artist or song. Enjoy iTunes Radio ad-free once you subscribe to iTunes Match. —Genius Shuffle — Introducing a magical new way to experience your music library. Choose Genius Shuffle and iTunes instantly plays songs that go great together. Click it again to hear something new—enjoying your music has never been this easy. —Podcast Stations — You can now create custom stations of your favorite podcasts that update automatically with new episodes. Your stations, subscriptions, and current play position sync over iCloud to the Podcasts app. —Sync with iOS 7 — You can now use iTunes to sync your favorite music, movies, and more to devices with iOS 7. 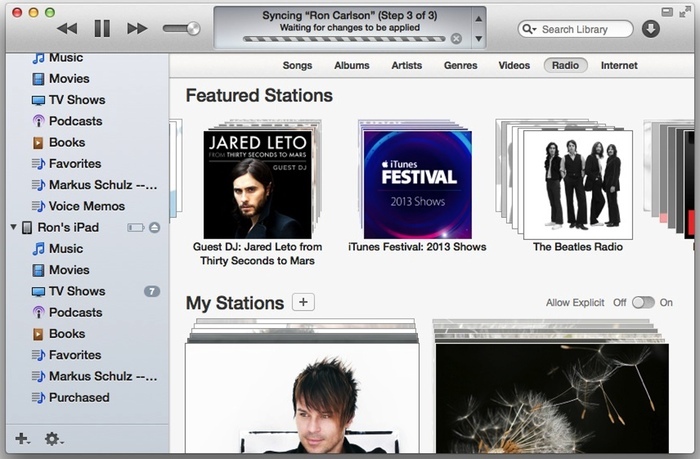 In addition, iTunes now makes it even easier to quickly organize and sync apps to your iPhone, iPad, and iPod touch. For consumers, the two big user-facing features are iOS 7 device syncing and iTunes Radio, which is nice but still a work in progress. In fact, iTunes Radios most appealing feature is simply that it’s integrated into iTunes and iOS 7, potentially making it the default streaming audio solution for hundreds of millions of users. Bye bye, Pandora and Spotify? Those two services are certainly shaking in their boots — iTunes has killed off scores of competing music stores and Apple has proven ability to disrupt markets.